Looking back at the challenges we faced as students and professionals, we realize that our success was based on a core set of skills and values, refined over time by hard work and experience. Now, as educators, we set out to create a rich and unique curriculum that does not only promote academic excellence, but also supports children and youth to create an impact beyond the classroom. In early 2009, Agnes and Yvonne left their corporate jobs and reconnected at the crossroads of their lives. The search for fulfillment and meaning in their professional lives led them to found LEAP Studio, now The Open Classroom. They set out to create a program that would nurture students into global-minded, socially responsible and happy individuals who are well equipped to succeed in whatever path they may pursue. 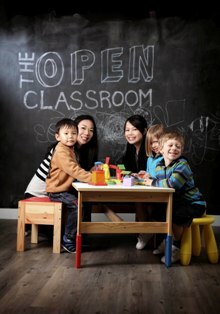 The mission and the uniqueness of The Open Classroom have attracted many like-minded educators and program partners. Passionate and devoted, all of them are armed with superb credentials, and more importantly, an aspiration to inspire young students and to personally engage with meaningful social causes. The Open Classroom takes a deep interest not just in the students' academic achievements, but also in their journeys in personal development.